Jaguar Land Rover is to halt production for an additional week due to potential disruption from Brexit. Jaguar Land Rover has told some suppliers that it won't be ordering any more parts from them for the next six months. 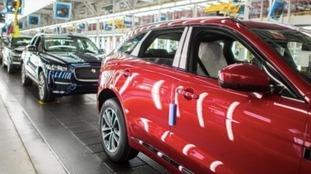 Jaguar Land Rover has announced a cut in production due to "continuing headwinds" affecting the car industry. 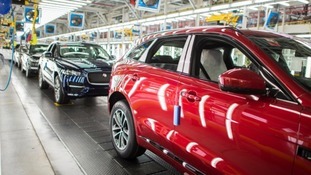 Jaguar Land Rover has confirmed it is cutting back production at its Castle Bromwich plant in Birmingham because of falling car sales. Prince Charles and the Duchess of Cornwall have been in the Midlands today - just a day after Prince Harry and Meghan Markle announced their engagement. Prince Charles met well-wishers in Stoke-on-Trent, telling them he was "very happy" about the wedding. The royal couple visited a chapel in Hanley, a pottery museum and Stoke City Football Club. ITV News Central reporter Melissa Wright was there. The Royal couple were in the West Midlands visiting Jaguar Land Rover, William's beloved Aston Villa and a famous whistle maker. Jaguar Land Rover has announced plans for a £200m redevelopment of its base in Gaydon in Warwickshire. The site is JLR's design and engineering centre and the plans present the first major construction project at one of the company's non-manufacturing sites in more than a decade. The company says it hopes to make the site 'the world’s foremost automotive product, engineering and design sites'. The new design and engineering centre is a testament both to Jaguar Land Rover's British heritage of innovation and its compelling vision for future vehicle technology. The new space will centralise our design, product engineering and purchasing functions in an original and modern environment, as well as creating additional capacity for the future. A multimillion-pound haul of engines stolen from Jaguar Land Rover's largest UK factory has been recovered in dawn raids. Detectives investigating a £3 million engine heist at Jaguar Land Rover’s factory in Solihull have arrested three men.